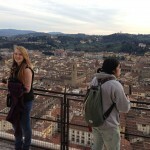 We were hot to see the Academia Gallery in Florence, Italy, birthplace of the Renaissance. One of the world’s most famous museums, its star attraction is the iconic 17-foot statue of David created in 1504 by Michelangelo. We reserved tickets to the Accademia months ahead of our visit because people had told us of having to stand in line in the hot sun and sweat like pigs in sauna heat for two hours to get in. Thanks to a wise vacation decision, however, we didn’t even need reservations. There WERE no lines. All visitors, like us, walked right in. And rather than having to jostle within a mob to get close to David and view him above heads and shoulders, we found ourselves in the huge space around him in the company of only a few other visitors. And there was no suffering in hot sun and sauna heat. Our wise vacation decision was to go there in the extreme off season, specifically in our case late January. The Academia, the Uffizi Gallery, the Bargello Museum, the Basilica di Santa Maria del Fiore – in every attraction it was the same. It was almost as though we had the historic city and its attractions to ourselves. Sure, the weather was cooler than in summer, sometimes rainy, but the hotel rooms were comfortingly warm retreats rather than the insufferable hot-boxes they can become in a Mediterranean summer. The Chianti wine country around Florence was gothically beautiful when mists drifted among the hills while a cheery fire crackled in the tasting room of the Poggio Amorelli winery on a hilltop with view of countless other hilltops and hillsides corduroyed by vineyards. AND, we were the only people there. At a winery which, like other wineries, in summer throngs with visitors who drive in or step down from buses, we were the center of attention. 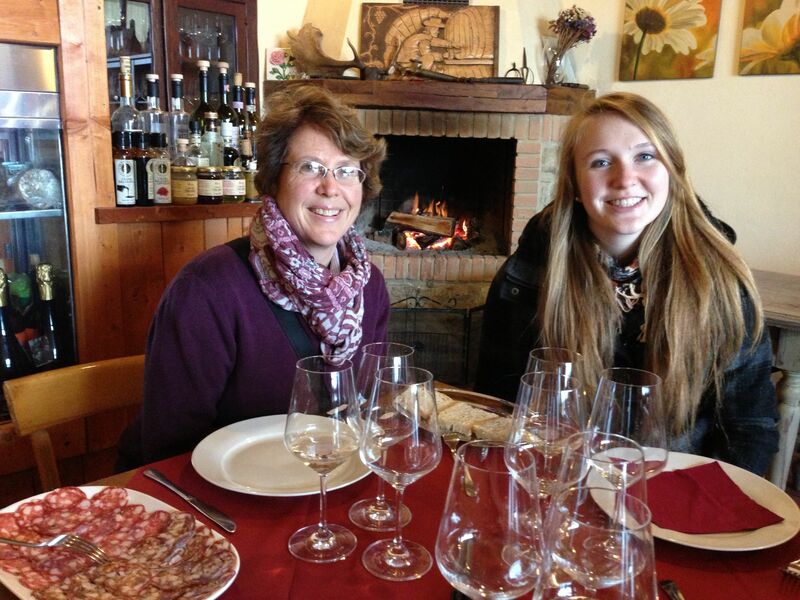 Our winery guide, Elena, alerted by a phone call from our driver, Leonardo, drove over from her home village of Monte Reggione a few miles away to open the winery and host. 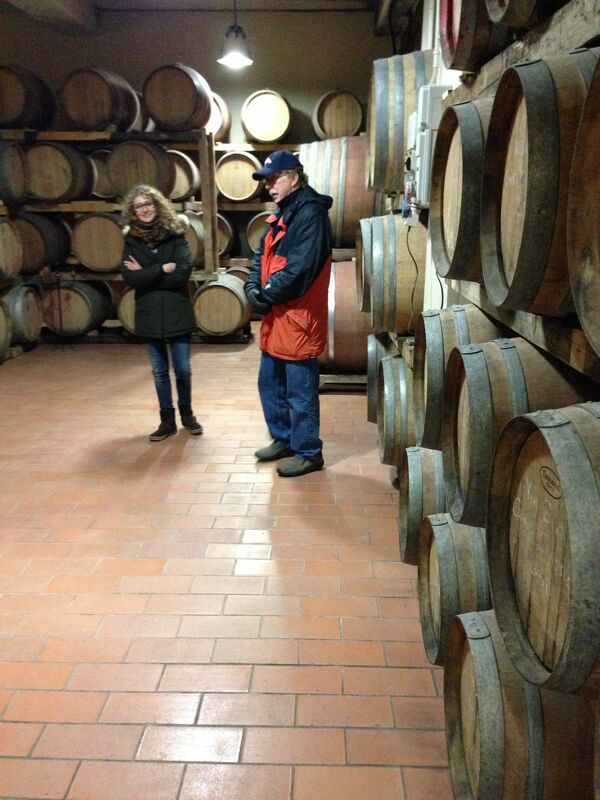 She began with a tour of the winery’s indoor operations, distillations and storage rooms. Last, we were led to the tasting room where the large number of tables attesting to the traffic of the tourist season now sat empty. Outside, it was misting and small clouds drifted in the hills and valleys. Inside, it was toasty warm near the fireplace where Elena had lined up a large number of bottles for the tasting, on a table spread with hors d’oeuvres of breads and spreads, sliced meats and cheeses to go with the wines. 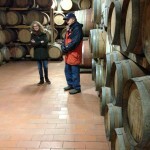 In the wine-tasting room of Poggio Amorelli. A horse appeared, visible through the glass of the tasting room’s outside door, and kept thumping its nose against the door, pushing it open again and again, begging for treats. Elena found some carrots for our daughter to feed the horse outside, where it was accompanied by a sheep that is its constant companion, Elena said, and a lamb following its mother around in the rain. These animal characters are, of course, among the tourist attractions of Poggio Amorelli, even appearing on the “Farmhouse” page of the winery’s Web site. Altogether it was an intimate and relaxed experience in which Elena spoke only with us and we could ask questions and converse without competition, an experience unavailable in the tourist crowds of summer. How did we come across this particular gem among the many that blossom around Florence? We asked in our hotel how we might take a tour outside the city, and did not realize until the hotelier told us that the region between Florence and Siena is the famous Chianti region. Our hotel, the Hotel David, we had found by the same mechanism that everybody should use to the extent possible: word of mouth. A guy we know told us that, oh sure, Florence, I stayed at a great place when I was there, the Hotel David. The Hotel David is a charming place owned by a family that has owned it for generations, with a mark on the wall of the lobby that you have to reach up to touch, a high-water mark from the great flood of 1966. The hotel is just across the street from the Arno River and an easy walk from the famous Ponti Vecchio, the post-card picture bridge lined by buildings cantilevered from its side, famous for its gold and silver shops and with a history including the famous Medici-era silversmith Benvento Cellini, a statue of whom stands among the shops on the bridge. A local legend of the 1966 flood is how one watchful watchman, seeing the flood rise, frantically spun the dial to get all the gold and silver and jewelry shop owners to tumble from their beds and rush down to save their treasures. Walking along the picturesque Arno, one can cross and be immediately in the old historic warren of narrow cobbled streets that has made old-town Florence a World Heritage Site. Seen from the heights of the Basilica di Santa Maria del Fiore, the streets below are deep narrow clefts that look rather like the slot canyons of Utah. Deep in the slot canyons of these streets, you can spend a lifetime with some of the world’s greatest shopping, if that’s what you’re into. 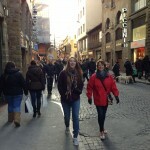 The shopping streets of historic central Florence. Leather goods! Few phrases are more famous than “Italian leather,” and boy is there plenty of it. The heady smell of new leather drifts from shop doors into the street, and I found myself periodically stepping to the door of a shop just to inhale the fragrance. We did buy some fine leather products, most notably two leather jackets on the Piazza Croce at a store called Poker Firenze, where the guy was nice and the prices reasonable. And then there are the restaurants, of course, the famous Italian cuisine. Some we found on our own, and some through the folks at the hotel. Among their suggestions was Aqua al 2 on the Via Della Via Vecchia, one of those exquisite little places that’s hard to find. 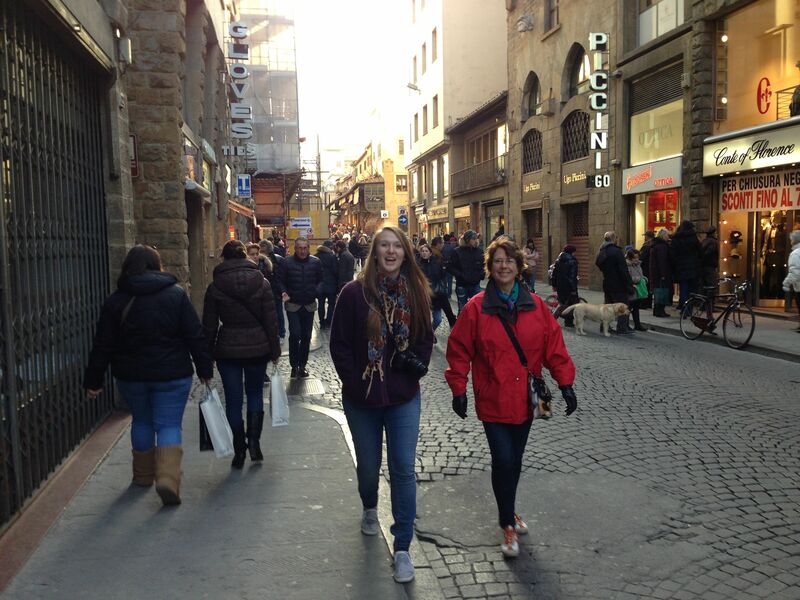 We endlessly wandered the warren of historic central Florence with a map that proved inadequate. It turned out that it was off on a side alley and invisible from Via Della Via Vecchia, and we only found it by asking at a nearby hotel. Another great restaurant, on another evening, was Osteria Del Cinghiale Bianco, with seating in a stone nook that looked an alcove in some subterranean Etruscan tomb and Tuscan cuisine including what I of course had to have, the restaurant’s signature Cinghiale, wild boar in polenta with cream sauce. Outside of art museums, the Basilica di Santa Maria del Fiore may be Florence’s star attraction, ordinarily called simply “the Duomo” for its historic dome, and built from 1296 to 1436 with the world’s first great dome famously engineered by Filippo Brunelleschi. On our first pass at the attraction, it was already late and dark and the Basilica was closed, but we discovered that one could still go up in the church’s great tower, Giotto’s Campanile, for 8 euros, a long, long climb of 414 ancient stairs. Around and around the stone tunnel we went up to the high viewing point at the top of the tower looking down all around the lighted streets far below and the views into the distance in every direction, and the moon had just risen over the dome. During the day time, we did the dome itself. Up 463 stair steps, you emerge on a circular walkway directly under the dome and can look up close at the frescoes of the last judgment by Giorgio Vasari. Then you can continue up more stairs that take a weird curving route between the two shells of the dome, stooping some of the time to avoid hitting your head until you emerge at the colonnade on the top for fantastic views of the city. 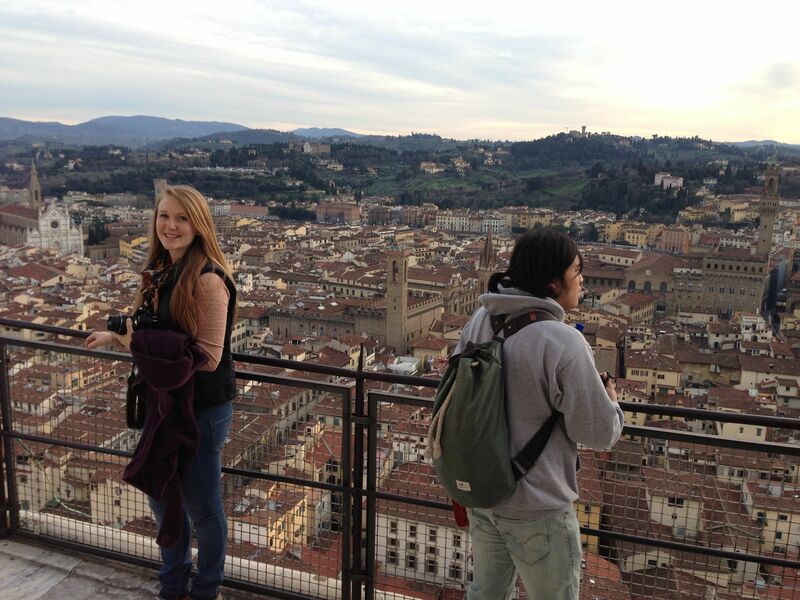 The Florence vista from the top of the Duomo. The art museums are the other big attraction, with all those famous paintings you’ve only seen in books glowing with color right in front of you. Like the fabulous Uffizi, with works by Reubens and Michelangelo, Titian, Da Vinci and Boticelli. And the fabulous Museum Bargello, housing the national art collection. Be sure to take an excursion out of the city, of course. 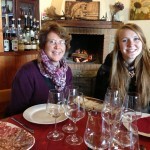 Our was, as mentioned above, a trip to Siena via the Chianti region. In addition to our winery visit, we hit little towns along the way, including Castellina in Chianti, with a picturesque plaza surrounded by shops along porticoed sidewalks, and also the location of a small outlet shop for Poggio Amorelli. And the town of Fonterdudoli, a tranquil village five kilometers south of Castellli in Chianti on hills facing the landscape of Chianti Classico. And Monte Reggione, a village around a hilltop fortress which was once a forward outpost of Siena in its wars against Florence. And the city of Siena, that’s a story in itself for another time. Is it just because it’s Italy that made people so notably welcoming and pleasant? Or is it at least partly the time of year, when instead of being overwhelmed and feeling beset by tourists, local folks appreciate your visit in the leaner off times and are happier for the company of tourists? At 5:30 on our last day before flying out, we walked from our hotel to a nearby restaurant, Pizzeria La Gattaguia, where when dinner was done I ordered the brandy known as grappa (and grappas are minimum 35% alcohol, I understand ] as a dessert liqeour. Then I ordered another one, and when that was done the waiter – or was he the owner – approached with a ceremonial air and placed another one before me. In answer to my quizzical expression, he said, it is complimentary. For you. Very strong. It’s home-made, he said. Oh, I said, you make it here? No, he said, I make it at home, and he grinned. It’s very strong. It was, both in the taste of the pulp, seeds and stems that characterize this particular distillation, and in the overwhelming power of the alcohol. This gastfreundlichkeit reminded me of the time in a little restaurant in Waco, Texas, when the waitress set a mason jar, filled with a clear liquid, before me with a smile. On the house, she said. It was moonshine, and powerful stuff. “Southern” hospitality, of a kind you find in any place where guests are appreciated and welcome as they seem to be especially in the tourist off season in the southern climes of Florence, Italy.